Wonder August (Auggie) Pullman was born with a facial deformity that prevented him from going to a mainstream school--until now. He's about to enter fifth grade at Beecher Prep, and if you've ever been the new kid, then you know how hard that can be. The thing is Auggie's just an ordinary kid, with an extraordinary face. But can he convince his new classmates that he's just like them, despite appearances? 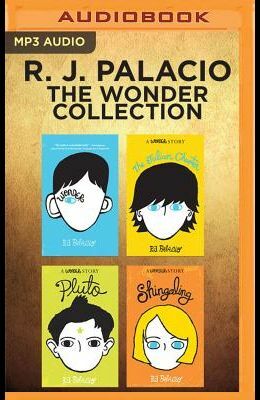 The Julian Chapter The Julian Chapter gives readers a chance to hear from Wonder 's most controversial character. From the very first day Auggie and Julian met, it was clear they were never going to be friends. This story finally reveals the bully's side of the story. Why is Julian so unkind to Auggie? And does he have a chance for redemption? Pluto Pluto offers a peek at Auggie's life before Wonder . Christopher and Auggie were best friends from the time they were babies until Christopher's family moved away; he was there for all of Auggie's earliest memories, from surgeries to Star Wars marathons. Pluto is the story of two boys who have grown apart but are learning that good friendships are worth a little extra effort. Shingaling Shingaling shines new light on life as a fifth grader at Beecher Prep--as seen from the perspective of Charlotte, the girl chosen to be Auggie's welcome buddy. Readers will learn more about Charlotte and her budding friendship with reader-favorite Summer, how the girls at Beecher Prep react to Auggie attending their school for the first time, and how Charlotte came to write the precept she used at the end of Wonder It's not enough to be friendly. You have to be a friend.